Designed for Business owners, bookkeepers, and payroll professionals. Clockspot lets employees clock in or out from any computer or phone. Which makes it perfect for businesses with multiple locations, or businesses with employees who work from remote job site, like cleaning companies, or home healthcare businesses. Clockspot is web based. No software installs, free updates, access from anywhere. You can manage your employees from any computer with internet. Clockspot is compatible with all major web browsers. 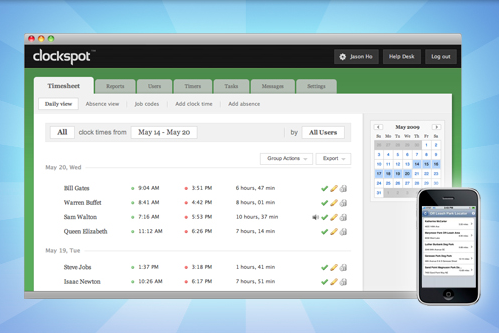 Clockspot officially support both Mac and PC versions of IE7, IE8, Firefox, Safari, Chrome, and Opera. That means it works on tablet devices such as the Ipad or Samsung Tab. Clockspot is used by thousands of businesses of all industries and sizes.